Fu Lin Men ('FLM') is a fine dining Chinese restaurant concept by Passion Group located in Jurong Country Club. 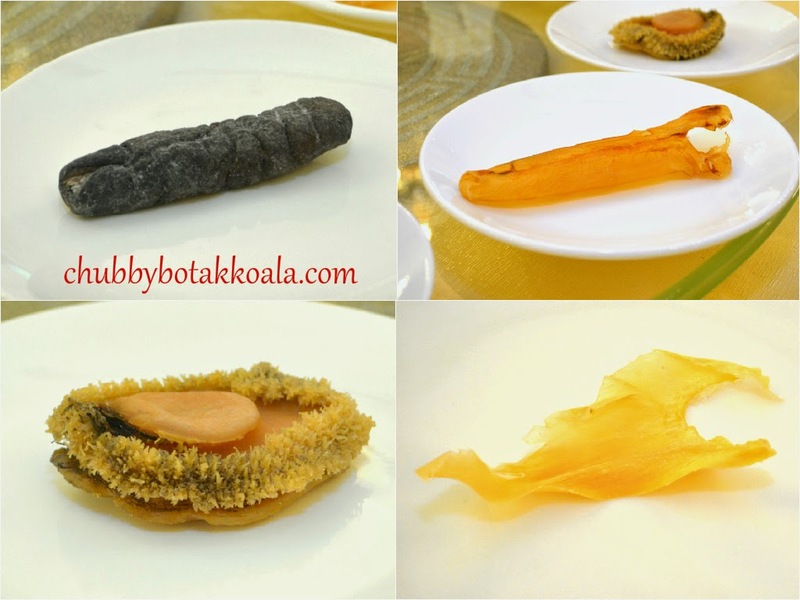 With award winning Chef Roy Tan as Executive Chef, FLM presents Chef Roy interpretation of “Four Heavenly Kings of Chinese Cooking” (Abalone, Shark's-fin, Sea Cucumber and Fish Maw). Due to its location in a country club, the restaurant can be quite secluded from the public. Club members made up bulk of its regular customers, however the restaurant is open to public. From the restaurant, you see the beautiful greenery of the golf course, which was more mesmerising during sunset. The dining hall is elegantly decorated with beautiful chandeliers that fit for Grand Wedding Banquet. We started the tasting with Deluxe Appetizer Platter. The appetizer ingredients are quite similar to the cold dish that you have in a wedding banquet. Seasoned baby octopus, seaweed and fried fish & shrimp roll. The appetizer tasted clean, light and refreshing. The seasoned baby octopus is crunchy, springy and not overly seasoned. I like the lotus chip on the side for its' texture. Superior Comb Shark's Fin in Stone Pot is the main star on my set. Serving is quite huge, the broth is rich, thick, creamy and robust. The comb shark's-fin has a consistent nice crunchy texture to it, and it does not have a fishy smell. No vinegar needed for this shark's fin soup. Kudos to the Chef for the extensive prep. Deep Fried Fish Fillet in Thai Style & Baked Roast Pork with Jumbo Mushroom follow next. The fish is nicely fried, crispy on the outside, soft and moist in the inside. The thai sauce is light, packs with subtle spicy flavour behind it. The baked roast pork is unique and creative. It allows the roast pork to retain its crispy crackling, while meat and mushroom remains succulent. Slightly odd combination, but it works. The sweet potato chip on the side also taste good. For carbo, I had Udon with Sesame Sauce. Not a Chinese dish, but more toward a Japanese dish which I normally order when I dine in a Japanese Restaurant. The udon is springy and the vegetables are fresh. The tamago has a nice sweetness to it. The only comment that I have is that the sesame dressing is just too light, might be better if its more and thicker. Dessert was Hawthorn (Shanzha) Jelly. Hawthorn is normally used to improve the digestive system and lower high blood pressure in Traditional Chinese medicine. It has a unique sour taste, combine with the sweetness of the jelly, turn out to be a refreshing dessert. It is good to have a nice and healthy dessert. Meanwhile, thanks to the generosity of other food blogger, I manage to sample other dishes. Thanks to The Artic Star, I get to sample Braised Fish Maw & Scallops Foie Gras Pate. Unlike the common fish maw that we find in the market, this fish maw was air dried instead of deep fried. The texture is smooth, springy and has good bite to it. It absorbs the flavour of the broth well, including the foie gras as well. A good fish maw does not have the pores feel like fried pig skin. It is also proven that fish maw is beneficial for the ladies. Currently, FLM also having the Shroom Set menu ($58.80++) which include deluxe fungus range such as Morchella, Truffle and Porcini. I manage to sample Stir Fried Diced Angus Beef with Ceps Sauce. The beef are stir fried to perfection. It is tender, succulent and well coated with creamy ceps sauce. Nice pairing of mushroom sauce with a top grade ingredient. Definitely worth to try. Overall, I find the set menu here is extremely value for money. The food are tasty and the execution of the dishes are top notch. Due to the current market condition and over supply of ingredients in HK, the owner of FLM manage to get Four Heavenly Kings ingredients at a very good price and pass on this savings to the customers. So Fu Lin Men is definitely on your must try list. Cheers!! Thank you very much to HungryGoWhere and Fu Lim Men team for the tasting invitation.